We can now show the latest 6 x 1st class retail booklet which will be issued to Post Office branches and other retail outlets to replace the Olympic definitive booklets which were reintroduced in some places during the summer. The official release date is 1 October. The booklet is printed by Walsall Security Printers, with cylinder numbers W1 blue, phosphor, and iridescent in that order. The source code is MSND to the right of the Queen's head. Cylinder booklets appear to be hard to find in initial stocks. 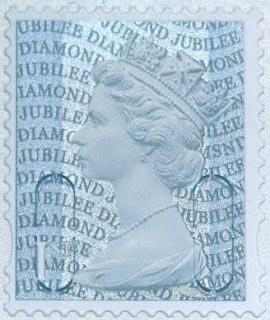 We will obtain a few first day covers for these new definitive stamps. I was able to order this from Talents House with no problems. The order code is UB355. We have a very small number of First Day Covers for these on sale now. If when you click on this link there is no entry on our shop, that means they are all sold - SORRY! Oops, that should be in the blogpost, thank you for bringing it to our attention. The reason it's not listed in the October Bulletin is that it was issued before that list starts, unlike the listed Goon Show and Space Science issues which appeared before the Bulletin was received! Incidentally, in the same Bulletin, the Christmas issue is listed in the Calendar as being on 8 November, but on page 46 it is shown correctly as being issued on 6 November. Thanks Ian. I would have missed this booklet if it had not been for your blog. I checked back in September and August editions of the Bulletin and can still find no mention of this booklet. Further to previous question and reply: I was able to order this from Talents House with no problems. The order code is UB355. Was anyone lucky enough to get a cylinder book? This booklet still isn't available at the philatelic counter at Trafalgar Square which is unusual as they usually have everything! I suspect this one may become quite collectable as it can't have a long shelf-life being released so late in the Jubilee year.